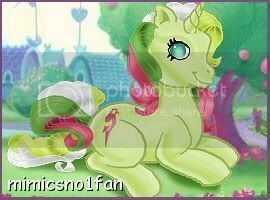 My Little Pony Arena » Forums » TCB » Wanted! » WANTED! Wave 2 Blind Bags! Forums » TCB » Wanted! » WANTED! Wave 2 Blind Bags! WANTED! Wave 2 Blind Bags! Posted: 0 Post subject: WANTED! Wave 2 Blind Bags! Looking to trade my Baby Cherries Jubilee and others for a full set of wave 2 blind bags excluding the solid colour mane 6! I'll Trade only, this post is mostly for swaps. I'm not fussy about the condition of the pony, as long as it hasn't got a hair cut or any obvious flaws, I'm okay with it. G2's must have both eye gems and So Softs must have perfect flocking. Yr 1 My Little Pony: Snuzzle, Cotton Candy, Minty, Bluebelle, Blossom. Yr 2 Unicorn and Pegasus: Moondancer, Twilight, Sunbeam, Medley. Yr 2 Rainbow Ponies: Sunlight, Skydancer. Yr 3 Unicorn and Pegasus: Heart Throb, Skyflier, Powder, Surprise. Yr 3 Rainbow Ponies: Flutterbye, Confetti (US), Pinwheel. Yr 3 Baby Ponies: Baby Moondancer, Baby Surprise, Baby Glory, Baby Blossom, Baby Cotton Candy. Yr 4 Twinkle Eyes: Speedy, Galaxy. Yr 4 Flutters: Morning Glory, Forget-Me-Not, Peach Blossom. Yr 5 Twinkle Eyes: Bright Eyes, Quackers, Mimic. Yr 5 TAF Ponies: Dancing Butterfies, Love Melody, Sweet Tooth, Up Up Away, Milky Way. Yr 5 Flutters: Wind Drifter, Wing Song, Tropical Breeze, Cloud Puff. Yr 5 Big Brothers: Salty, 4-Speed, Quarterback, Slugger, Tex. Yr 5 First Tooth Babies: Baby Quackers, Baby Lickety Split, Baby Fifi, Baby Tic-Tac-Toe. Yr 5 Newborn Twins: Milkweed & Tumbleweed, Jangles & Tangles, Rattles & Tattles, Doodles & Noodles, Dibbles & Nibbles. Yr 6 TAF Ponies: Buttons, Merriweather, Yum-Yum, Munchy, Night Glider, Bonnie Bonnets. Yr 6 Summer Wings: High Flier, Glow, Lady Flutter, Sky Dancer, Little Flitter. Yr 7 Perfume Puffs: Red Roses, Sweet Suds, Sweet Lily, Lavender Lace, Dainty Dahlia, Daisy Sweet. Yr 8 Rainbow Curl Ponies: Ringlet, Stripes, Streaky, Raincurl. Yr 8 Baby Sparkle Ponies: Baby Firefly, Baby Gusty, Baby Starflower, Baby North Star. Yr 9 Baby Rainbow Ponies: Baby Brightbow, Baby Sunribbon, Baby Rainribbon. Yr 10 Paradise Babies: Baby Palm Tree, Baby Beach Ball. Any Twinkle or Sunsparkle Petites. Glitter Ponies: Sparkleworks I or II, Pinkie Pie I or II. Rainbow Ponies: Rainbow Dash I or II, Sunny Daze I or II, Wysteria, Sweetberry, Tink-a-Tink-a-Too. Season Celebration Ponies: Butterscotch, Autumn Skye, Spring Fever, Star Swirl, Winter Snow, Sweet Summertime. Perfectly Ponies: Sunset Sweety, Cinnamon Breeze, Piccolo, Spring Parade, Triple Treat. Sparkle Ponies: Desert Rose, Merriweather, Starbeam, Peachy Pie, Rainbow Swirl, (US Excl. Blue Mist, Savannah Sage). Jewel Ponies: Crystal Lace, Valenshy, (US Excl. Juniper Jade, Winterberry). Dress-up Eveningwear: Crystal Lake, Wind Wishes. Perfectly Pony: Alphabittle, Fair Weather, Twilight Twinkle. Dazzle Bright Ponies: Kiwi Tart, Ribbon Wishes. Sunny Scents: Lavender Lake, Apple Spice, Tangerine Sunset. Dream Design: Cloud Climber, Desert Palm, Paradise Palms, Beach Comber, Sand Dollar, Summer Berry. 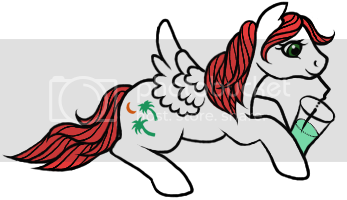 Pegasus Ponies: Aurora Mist, Pearly Pie, Twilight Pink, Twinkle Bloom, Snow’El ’07, Tira-Ma-Su, Mochanut. Unicorn Ponies: Sunrise Song, Garden Wishes. Posted: 0 Post subject: Re: Desperate for blind bag G4's! And single G4 Spike! Posted: 0 Post subject: Re: Desperately looking for TWINKLE EYES! Posted: 0 Post subject: Re: G1's, G2's, G3's, and TWINKLE EYES! Good luck in finding everything you want! I have Ivy and Queen Sunsparkle but I've checked your trades and can't see anything right now I'd be interested in. Just in case, Ivy is 15 USD and Queen Sunsparkle 35 USD both MIB/MOC. I'm going to send you a PM! I have Twinkle Twirl, Sparkleworks, Rainbow Dash, Star Swirl, Pinkie Pie, Sweetberry, Denim Blue, and Amberlocks up for sale. I can get pics and/or descriptions of them if you would like. Thanks to Fraulein Kim for my avatar and Lina for my sig! Sent you a PM ElementalParadise! Posted: 0 Post subject: Re: Looking for a pair of Flutter Pony Wings!